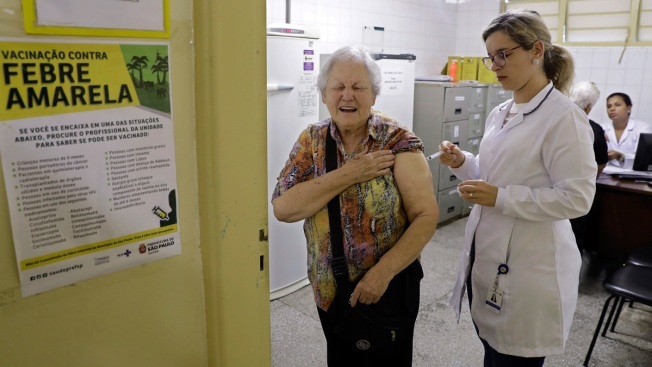 FILE - In this Jan. 16, 2018 file photo, a woman receives a vaccine against yellow fever at a public health center, in Sao Paulo, Brazil. The Health Ministry said Wednesday, March 7, 2018, that Brazil's yellow fever outbreak has now infected more people than the previous one, which had been the largest in decades. The Health Ministry said Wednesday that officials have confirmed 846 cases of the mosquito-borne disease. Of those, 260 have died. In the 2016-2017 outbreak, Latin America's largest nation saw 777 cases and 261 deaths. Large swaths of Brazil have long been at risk for yellow fever. But the previous outbreak and the current one are happening in areas not previously considered at risk for the disease and where vaccination rates were low. The current outbreak is hitting the populous states of Sao Paulo and Minas Gerais hard and encroaching on major cities. In response, Brazil has launched a campaign to vaccinate more than 23 million people.